Driving home from Atlanta yesterday afternoon, Misty and I were caught in a sudden hailstorm. We pulled off to the side of the road under a bridge, but there was so much wind that it didn't offer much refuge from the pelting hail. When we finally started driving again the conditions were very hazardous. We were driving on icy marbles. There was so much hail that it looked like snow. 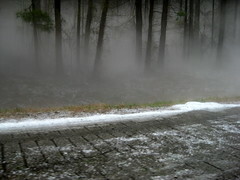 The cold hail on the ground was mixing with the warm air and creating a fog. Worse, it was the time of day when the sun in the west was directly in our line of sight. We narrowly avoided a 3-car wreck which looked like it had happened only a couple minutes before we passed by. There were also reports of numerous other wrecks which temporarily shut down the highway. I'm thankful that Misty and I made it though safely.